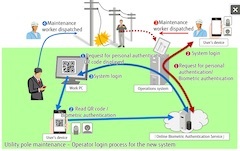 TOKYO, Mar, 04 2019 - (JCN Newswire) - Fujitsu Limited announced that TEPCO Systems Corporation has adopted Fujitsu's Online Biometric Authentication Service, compliant with the Fast IDentity Online (FIDO) next-generation online authentication standard, for their newly developed system(1) to improve the efficiency of utility pole maintenance operations within TEPCO's service area. This new system conducts operations by cooperating with local residents, in order to improve the efficiency of the operations of TEPCO Power Grid, Inc., the company that handles utility pole maintenance operations, as well as to ensure safety for the local region. When residents in an area notice something unusual about a utility pole, they can submit pictures through TEPCO's website. This way, employees of TEPCO Power Grid can get a handle on the situation from the pictures before heading to the site, enabling a faster response. 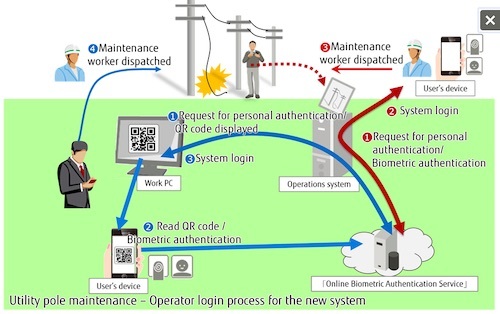 Now, by adopting Fujitsu's Online Biometric Authentication Service for authentication when maintenance workers login to the system from work PCs and smartphones, the convenience of personal identification has increased, strengthening security and improving operational efficiency. In recent years, there has been a demand for stronger security in a variety of systems, such as setting complicated passwords for each system, in order to handle information including company secrets or personal information. At the same time, however, there have been concerns that this is not only compromising the convenience of operations, but actually inviting further risks. For example, there are risks of using the same password on multiple services or of information leaks due to losing notes with passwords written on. In these circumstances, biometric authentication has attracted attention as a method for strengthening security in place of existing ID and password systems. In addition to the costs required for updating authentication system platforms, there is also the issue of the significant man-hours required for system deployment, such as clarifying security requirements and finding time for system building. When considering the deployment of its new system, TEPCO Power Grid, Inc. faced the same sort of issues, but it was able to set up its new system in a short time by using Fujitsu's Online Biometric Authentication Service, which provides the necessary servers and software to implement a FIDO-compliant biometric authentication system, as well as existing biometric authentication-capable smartphones. For the new system developed by TEPCO Systems, in addition to providing the servers and software on the cloud necessary for FIDO authentication, Fujitsu also offers a service supporting the development of the client app. When personal authentication is needed to login to the system from a work PC, the work PC and the user's smartphone can be linked by reading a QR code displayed on the PC's screen with an app on the smartphone. Consequently, the user can securely access the system with FIDO authentication using the biometric information stored in the smartphone. Maintenance workers on site can also check the situation by using their smartphones to access the system with FIDO authentication. Because a company-provided smartphone can be used, there is no need to deploy new biometric authentication devices, and user convenience is enhanced through password-less online authentication. Fujitsu plans to extend the Online Biometric Authentication Service to other use cases going forward. By expanding the deployment of FIDO in services related to social infrastructure, the company will contribute to the resolution of issues such as security and convenience for a variety of customers. (1) Newly developed system developed by TEPCO Systems on subcontract from TEPCO Power Grid.